If finalized, the IMF agreement will unlock $8 billion in cheap loans for Ukraine in 2019, Anders Aslund, Atlantic Council economist, tells Voice of America. "Ukraine is now likely to receive $2 billion from the IMF, $2 billion from the EU and the World Bank, the Ukrainian government is likely to place $2 billion in Eurobonds, and state companies are likely to place Eurobonds at another $2 billion or more," he said from Washington. "This should be enough for Ukraine to maintain a fairly stable exchange rate next year." ICU investment bank calculates the money flow at $7 billion. To win final IMF Board approval, Ukraine must adopt a 2019 budget with a deficit of 2.3% of GDP, turn the Anti-Corruption Court into a reality, and raise gas prices, as promised by 23.5% on Nov. 1. The provisional IMF deal boosts President Poroshenkos reelection chances, writes Bloomberg View columnist Leonid Bershidsky. The deal has the added effect of making President Petro Poroshenko a viable candidate in the 2019 elections, writes Bershidsky, a Russian journalist based in Berlin. An economic collapse before Ukrainians go to the polls is unlikely now. He adds: The governments liquidity crunch no longer threatens to turn into a full-blown crisis, and the national currency, the hryvnia, is unlikely to tank. Gas heating is subsidized for 7 million households, almost half of Ukraines 42 million people,Prime Minister Groysman said Monday night on ICTV. He also promised not to make a second, 35% gas price hike to bring household levels to the regional market price. Addressing a highly sensitive issue, he said: This will not happen because it is unacceptable for Ukrainian citizens. Looking ahead, he said: Everything will depend on world prices for gas as a whole and on the import parity. Over the next five years, the Finance Ministry wants to more than cut in half state ownership in Ukraines banking sector, first with the privatization of UkrGasBank in 2020 and, later, of PrivatBank in 2022, Ukrinform reports. Yuriy Galeta, deputy finance minister, says the goal is to reduce state ownership of the banking sector from 55% today to 24%. He noted that a third state bank, Oschadbank, works closely with the EBRD. Last May, EBRD President Suma Chakrabarti said in Kyiv that the development bank would like to take a stake in Oschadbank. Kernel, the worlds largest producer and exporter of sunflower oil, outlines its three year, $550 million investment plan in its new annual report. By the end of 2019 at Chornomorsk port, Kernel plans to open an expanded grain storage terminal with an annual storage capacity of 4 million tons. By the end of 2020, the company plans to install five heat and electricity plants. Fueled on sunflower husks and generating a total of 72 MW, the plants will power Kernel facilities. In 2021, the company plans to commission an oil processing plant capable of processing 1 million tons of grain a year and storing 100,000 tons of sunflower oil. Powered by the 22 MW biomass powered plant, the new complex will be in Starokostiantyniv district of 50 km north of Khmelnytskiy city. Close to receiving up to $250 million in long-term funding from the European Investment Bank, Kernel saw Fitch reaffirm its B+ rating with a stable outlook. By contrast, Ukraines rating is B- with a stable outlook. Concorde Capitals Andriy Perederey wrote Tuesday: We support Fitchs view that Kernels expansion plans will result in a profits rebound in case of successful implementation. So far, we believe that the companys rating, which is two notches above the sovereign rating, looks justified. Canadas insurance giant, Fairfax Financial Holdings Limited, is buying the Ukraine subsidiaries of AXA, the French insurance multinational. AXA reported on its website that it is selling 100% of its Ukraine companies, but did not cite a price. German Chancellor Angela Merkel has decided to help finance a EUR 500 million LNG terminal designed to land U.S. liquefied natural gas at a German North Sea port, The Wall Street Journal reports. Pressured by U.S. sanction threats over the Russia-Germany Nord Stream 2 Baltic pipeline, Germanys government may fast track approval of a long delayed LNG terminal. Construction could be complete by 2023, if funding is approved by the end of this year, says Manfred Schubert, the CEO of LNG Stade, one of two competing projects. Both projects would be on ports facing Scotland: Brunsbttel, on the Elbe River, and Wilhelmshaven, the historic navy base, closer to Holland. American LNG can meet Europes growing need for gas at prices competitive with Russian pipeline gas, Mark P. Mills, an energy expert with the Manhattan Institute, writes in the Financial Times. Calling the US, the worlds biggest and fastest growing natural gas producer, he says the US could go far beyond current plans to triple gas exports. Within a couple of years the number of LNG cargoes trading on the spot market could reach some 5,000 a year, Mills writes calculating that US gas could fill EUs LNG landing terminals. Operating all those terminals at full tilt could bring in triple the supply the Nord Stream 2 pipe will, if it is ever completed. Facing potential cuts in Russian gas deliveries in 2020, Naftogaz plans to invest $1.2 billion to boost natural gas production next year, Yuriy Vitrenko, the state energy companys chief commercial officer, tells reporters. Naftogaz also will invest $260 million to upgrade its massive east-west pipeline system. Gazproms gas transmission contract expires at the end of 2019. At the same time, Gazprom plans to start shipping gas to Germany through Nord Stream 2. Ukraine worries that its gas transit revenue will drop sharply in the early 2020s and that Gazprom will stop selling to Slovakia and Poland sufficient volumes for resale to Ukraine. After a rocky start with a spring drought, Ukraine expects to finish this year with its second-largest grain harvest in its history 64 million tons. The record was 66 million tons in 2016. This year, boosted by a bumper corn crop, production will be up 4.4%, reports the Agrarian Policy and Food Ministry. During the current marketing year, which ends next June 30, Ukraine expects to export 42.5 million tons of grain, up 7.8% from last year. So far, 12 million tons have been exported. Chinas Xinhua news agency, highlights the new forecasts noting that last year China was Ukraine's largest corn importer, accounting for 16.4% of total exports, and the second-largest barley importer, accounting 19.3% of total exports. Hydro, Ukraines Soviet-era renewable energy source, is winning this years race among renewables for energy production. Foreign investment in solar and wind get all the headlines, but hydroelectric power stations generated 31% more power year over year. Through September, Ukraines hydro dams generated 9.9 billion kWh, reports the State Statistics Service. Wind was up 6.6%, to 700 million kWh. Solar was up 23.2%, to 500 million kWh. As part of a new policy to promote biogas in farming, the EBRD will loan EUR 15 million for the first phase of a EUR 50 million, 20 MW biogas project for I & U Group, a major agro-holding in Kirovograd region, central Ukraine. By the end of next year, I & U plans to commission a 6 MW plant that will run on 60,000 tons of sugar beet pulp. Residue from biogas fermentation can be used as fertilizer. Waste water can be used for irrigation. Using highly efficient Austrian technology, the facility can also run on corn silage, chicken litter, and pig and cow manure. It is under construction at the Novomirhorod sugar factory, 65 km northeast of Kropyvnytskyi, the regional capital. The EBRD has signed a EUR 9 million loan agreement with Kropyvnytskyi Mayor Andriy Raykovich to modernize the trolleybus network for this regional capital of 235,000 people. Rebuilding the citys transport network will involve modernizing Soviet-era substations and buy 20 new Ukrainian-made trolleybuses. A food processing center is taking shape in a one-year-old industrial park, in Lanna, 70 km southeast of Poltava city. The Lanny Agricultural Group has inaugurated a $4 million, 80,000 ton grain elevator, the first stage of a complex that is to include a flour mill and a bakery. So far, the project is self-financed, Vladimir Sanzharivsky, deputy general director of Lanny, tells Interfax-Ukraine. Through September, retail sales are up by 5.5% in real terms, year over year, reports the State Statistics Service. This time last year, retail sales were up 8.8%. This years growth champions are: Luhansk, up 27.9%; Donetsk up 13.7% and Poltava up 11.1%. As usual, volume champions were: Kyiv -- up 3%; Dnipro up 6.6%; and Kharkiv up 1%. Concorde Capitals Evgeniya Akhtyrko writes: We anticipate retail trade to accelerate through the year end, supporting economic growth. We expect real retail sales to grow 7-8% yoy in 2018. Dragon Capital write retail sales are supported by 16% year over year growth of real salaries in August, and by a 26% year over year growth in remittances, to almost $1 billion a month this year. To minimize post-Brexit trade disruption, British and Ukrainian officials are working together to design a bilateral agreement that will replicate the effects of the EU-Ukraine free trade pact, Liam Fox, Britains State Secretary for International Trade, said during the recent Ukraine Week in London. We have designated Ukraine as one of the UKs post-Brexit priority markets, and our ambition is to further improve and liberalize the trading relationship between us, he said. Fox added that his department is working to help Ukraine win energy independence from Russia and is providing British expertise in agricultural machinery, grain storage, and food processing. AM General, maker of Humvee military vehicles, has joined the US-Ukraine Business Council.Since Russias 2014 attack on Ukraine, the US-based manufacture has delivered 75 Humvees and about 50 ambulances to Ukraines armed forces. With an eye to future sales, Andy Hove, AM General CEO has participated in two USUBC roundtables In New York with President Poroshenko. APCO Worldwide, a Washington-based global public affairs and strategic communications consultancy, also has joined the USUBC. APCO writes of their 2015-2016 work with then Finance Minister Natalie Jaresko: APCOs communications strategy was to swiftly build Minister Jareskos profile as a credible and authoritative international stateswoman and to help her foster a network of influential third party allies around the world prepared to publicly support her debt restructuring negotiations. Seven more US-made General Electric locomotives arrived at Chornomorsk, making for 15 now in Ukraine. The locomotives are being certified and should start hauling freight in November, Yevhen Kratsov, acting CEO of Ukrzaliznytsia, tells Magistral the railroads news site. ArcelorMittal, the largest producer of rolled steel in Ukraine, plans to triple its fleet of company-owned freight cars to 1,500. The next step, Aleksandrr Moroz, head of Arcelors logistics, says is company-owned locomotives pulling Arcelor freight trains. Last week, the Rada rejected a bill that would allow private freight trains. Undeterred, Moroz told Rail Expo 2018 in Kyiv that pilot projects should start next year. An ambitious plan to dredge 16.3 million cubic meters next year from Black Sea, Azov and Dnipro river ports has been approved by the Ukrainian Sea Ports Authority. Dredging work is to be completed at Chornomorsk, to 15 meters. On the Azov, the ports of Berdyansk and Mariupol are to be dredged. On the Dnipro river basin, dredging is to take place at Dnipro, Kyiv, Kaniv, Kremenchuk, Kamianske (ex-Dneprodzerzhinsk), Kakhovka and the Bug-Dnipro Liman Channel. Ternopil is the latest regional capital to win a McDonalds. The new restaurant can serve 2,000 meals a day. Across Ukraine, McDonalds served 100 million meals last year, 9% more than in 2016. On an average day, the equivalent of 1% of Ukraines population visits a McDonalds. The leader in Ukraines fast food sector, McDonalds has a 12% market share. SkyUp, a new Ukrainian discount airline, launches flights Dec. 27-29 from Kyiv Sikorsky to Barcelona, Sofia, Tbilisi and Poprad, a Slovakian ski resort in the High Tatra mountains. The airline owns two Boeing 737-800s. It has placed a $624 million order for five more Boeings, with delivery expected within five years. By February, Turkish Airlines plans to increase the frequency of flights from Istanbul to Kyiv by 50%, to 24 flights a week. Last month, it increased flights from Istanbul to Odesa to three a day. Last year, Turkish Airlines, the national flag carrier, carried 600,000 passengers between Turkey and Ukraine, an 18% increase over 2016. Turkeys largest airline flies to Kyiv, Kharkiv, Kherson, Lviv, Odesa, and Zaporizhia. Ukraine has raised $2 billion in Eurobonds -- $750 million for five years, and $1.25 billion for 10 years. The offering was oversubscribed, with bids totaling $4.9 billion. This demand pushed rates down about one quarter point from initial listing references. The final annual interest rate on 5-year bonds was 9%. On the 10-year bonds it was 9.75%. Of the new placement, $725 million will be used to redeem a bond that matures in February. This is the first long-dated dollar debt since Ukraine raised $3 billion one year ago. That 15-year bond priced at 7.375%. It now yields 9.417%, reports the Financial Times. Sergey Fursa, fixed-income trader at Dragon Capital, tells Bloomberg: High borrowing costs are the price for the delay in talks with the IMF. The government has authorized Naftogaz to raise $1billion for up to five years via Eurobonds.Co-organizers of the issue will be Citigroup Global Markets and Deutsche Bank AG. The issue will be listed on the Irish Stock Exchange. Separately, another state company, Ukrzaliznytsia, or Ukrainian Railway, says it plans to raise money through a Eurobond issuance before the end of this year. Dragon Capital writes on what Naftogaz might do with the bond money: Naftogazs aggressive development program, including investments in gas production, oil processing and retailing, which it may find constrained to finance in case the government decides to extract hefty dividends to help it fund utility subsidies in 2018-2019. Another focus area encompasses energy saving projects intended to cut gas consumption among low-income households and reduce gas bills. Central bank governor Yakiv Smolii predicts the first of IMF $3.9 billion could flow by the end of this year. First, the Rada must approve the budget. Prime Minister Groysman says he hopes this will happen by Dec. 1. Also by that date, Ukraine is to raise household gas prices by 23.5%. Then, the IMF Board in Washington has to approve the deal with Ukraine. Smolii says he expects the board to approve the 14-month Ukraine standby arrangement in December. Facing a November battle over the winter gas price hike, Ukraines leaders are on the offensive.Prime Minister Groysman said: The gas price will not rise anymore this year -- or this heating season. PeriodThose who have low incomes today are already on subsidies. They will not feel any increases. President Poroshenko said: Listen today to the promises of populists to reduce the price of gas by two, three, four or even six times. This can be done only by returning to Russian gas slaveryI advise you to listen less to the sweet voices of pseudo-defenders. Why? Because there is a lot of honey in them, there is little truth. Switching to electronic online auctions, the State Geology Service unexpectedly sold an oil and gas exploration permit for 4.3 times the expected price. Previously, critics say, permits were sold in backdoor deals, often to companies unqualified to develop the fields. But, faced with a potential cutoff of Russian gas supplies in 2020, the government now is moving to transparent online auctions, planning to hold monthly contests in 2019. On Thursday, in bidding on two fields in Lviv region, UkrGazVydobuvannya, got in a bidding war against two rivals for the largest field. UGV won with a $540,000 bid. The central bank predicts 3.4% GDP growth this year and a slowing to 2.5% next year.Underpinning growth will be private consumption due to increasing incomes, Yakov Smolii, governor of the National Bank of Ukraine, tells reporters. The bank has slightly raised its inflation forecasts: to 10.% for 2018 and to 6.3% for 2019. This weekend, executives from 12 major US companies arrive in Kyiv for what is billed as the first Ukraine trade and investment conference certified by the US Department of Commerce. After a welcoming speech by Prime Minister Groysman on Monday morning, they have two days of business-to-business meetings. In advance, Stepan Kubiv, Economic Development and Trade Minister, met Wednesday with US officials in Washington and then wrote on Facebook: I want to draw American business attention to the large privatizations which are just starting under the new rules. We offer private investors energy companies, as well as large infrastructure and industrial companies." Energy: Compass Directional Guidance, Equipetrol, LLC, Integrated Global Services, Inc. and WSC Inc.
Infrastructure: Baron Weather, Bechtel, FLIR, and Progress Rail. Ukraine has the largest amount of farm land of 42 European countries surveyed by OneSoil Map, a Belarus startup. According to analysis of European Space Agency photos, Ukraine has 35.9 million hectares cultivated in 2 million fields. This is 40% more than second place France, with 25.7 million hectares. Russia was not included in the survey. Using an AI algorithm to determine summer 2018 crop plantings, OneSoil says Ukraines top three crops were: corn -- 14.8 million hectares; wheat -- 5.4 million hectares; and grass -- 4 million hectares. Hungary is offering Ukraine a EUR $50 million long term loan to repair two roads running north from the Hungarian border into historically Hungarian-speaking areas of Zakarpattia. One road to be rebuilt would be 75 km the of road from the Astei crossing point north to Berehove and Mukachevo. The second road runs 12 km from the new crossing at Velya Papad north to Pyiterfolvo. Hungarian tourism to Zakarpattia is increasingly popular, but the poor state of the roads keeps many Hungarians from making the trip. Express train service from downtown Kyiv to Boryspil Airport starts next month, Prime Minister Grosyman tweets from on board a pilot run of the train. Starting in November, four newly renovated Polish-made PESA trains will shuttle back and forth on the 60 km route, allowing for departures from Kyiv Central Rail Station every half hour. The one-way fare will be UAH 80 or $2.85. With 12 million passengers expected to use Boryspil this year, Ukrzaliznytsia predicts that 3.8 million passengers will use the train to plane next year about 10,000 a day. The new, $21 million rail link crosses the Kyiv-Kharkiv highway and delivers passengers to a covered gallery connecting the new rail station, Boryspsil Airport, and Terminal D, the main international departures and arrivals facility and home base of UIA. After leaving Kyivs Central Rail Station, the train makes two stops. The first is at Vydubychi, a Green line Metro station and bus terminus for long distance buses from the south, notably Odesa. The next stop is Darnytsia Railway Station, terminus for Kyivs circular electrychka commuter rail line. Total running time, including stops, is 35 minutes. Turning north to Belarus, Ukraines often overlooked neighbor, President Poroshenko is setting a goal of doubling bilateral trade to $10 billion. Trade is growing by 15% percent a year, on track to hit $5.3 billion this year, Poroshenko said at a meeting in Gomel with Belarus President Alexander Lukashenko. With 100 Ukrainian companies in attendance, $101 million in contracts were signed at the two-day meeting, the First Forum of Regions of Ukraine and Belarus. Five of Ukraines 24 regions border Belarus. Gomel is Belarus main bridge for trade and investment with Ukraine, Gomel region governor Vladimir Dvornik told the forum on Friday. With trade growing by 25% a year since 2016, Gomels main Ukrainian trading partners are its three southern neighbors: Chernihiv, Kyiv and Zhytomyr. He said almost 40% of the 290 Ukrainian companies in Belarus are based in Gomel, many in the regional capitals free economic zone, Gomel-Raton. A road and rail hub for Belarus southeast corner, Gomel also serves as a transit point for Ukraines indirect trade with Russia. Ukraines finances are in better shape than many emerging market economies, but Ukraines 5-year Eurobonds placed last week at an interest rate of 9% -- 1 percentage point higher than comparable bonds for Pakistan and Sri Lanka, 2 points higher than Egypt, and 3 points higher than South Africa, writes Timothy Ash, senior sovereign analyst for Blue Bay Asset Management in London. At the start of this year, Ukraines 10-year bonds traded below 7%. On Friday, the new 10-year bond placed at 9.75%. Noting the Russia threat has not varied much in recent months, Ash blames the higher interest rates on Ukraines uncertainty in terms of the relationship with the IMF and foot dragging. He writes: The price of stalling gas price hikes has been high, and is now expressed in the large premium demanded by investors for holding Ukrainian Eurobonds, relative to its EM peers. Ukraine's ratios might be better than Egypt, but Egypt has almost faultlessly held to its IMF program, and benefitted from almost uninterrupted IMF credit disbursementsThe lessons of all this, is that Ukrainian politicians need to recognize there are costs associated with their political decisions. Kyiv advertising agency Banda has won Red Dots prestigious Agency of the Year award. Louise Milk, director of the international design contest, cited Bandas new campaign, saying:Ukraine Now stands for well-executed branding for an entire nation. In a separate competition, involving 8,610 entries from 45 countries, Banda won one of seven Red Dot Grand Prix awards, in this case for their brand design for OKKO, the Ukrainian gas station chain. Pavel Vrzhesch, Banda founder and creative director, Egor Petrov, art director, and Yaroslav Serdyuk, strategy director, attended the gala award ceremony Friday night at Berlins Konzerthaus. Russias harassment of merchant ships serving Ukraines two ports on the Sea of Azov has caused $36 million losses in the last six months and forced the main port, Mariupol, to move to a 4-day work week. Russian coast guard checks of freighters cause delays averaging 30 hours, and costing $50,000 a day to shippers, according to Volodymyr Omelyan, Ukraines Infrastructure Minister. The European Parliament passed a resolution last week calling on EU nations to prepare to sanction Russia if the Kremlin attempts to turn the binational sea of Azov into a Russian lake. Separately, US Ambassador to Ukraine Marie L. Yovanovitch visited Mariupol and later denounced: The negative economic impact on Ukraine of the growing Russian aggression in the Sea of AzovThe United States supports the sovereignty and territorial integrity of Ukraine, and urges Russia to stop the pursuit of international shipping in the Sea of Azov." Ukrainians received the most first residence permits in EU in 2017, Eurostat reports. Of the 661,874 permits granted to Ukrainians granted, 88% were for Poland. Of all EU permits to Ukrainians, 88% were for work. Confirming Ukraines emergence as the regional supplier of labor, Ukrainians were the top nationals receiving residency permits last year in: Czech Republic 18,887; Hungary 7,808; Lithuania 4,725; Slovakia 4,268; and Estonia 1,336. In Latvia, Ukrainians 1,528 -- came in closely behind Russians 1,628 -- for first place. Further away, Ukrainians ranked in third place in Bulgaria, Croatia and Denmark. Overall, Ukrainians received three times as many residency permits as the second largest nationality, Syrians 223,170. By tracking SIM card usage, Ukraines mobile operators say that subscribers made 17.3 million trips abroad in the first half of this year, the Economic Development and Trade Ministry posts on Facebook. The most popular destinations were: Poland, Russia, Hungary, Moldova, Belarus, Romania, and Slovakia. For inbound tourism, 9.6 million foreigners visited Ukraine in the first half of the year. The most popular cities were: Kyiv -- 1.8 million; Lviv -- 1.5 million; Zakarpattia -- 800,000; Odesa -- 600,000; and Kharkiv -- 500,000. Traveling internally, Ukrainian mobile sim card owners made 65.7 million journeys. Top destinations were: Kyiv -- 18 million subscribers; Lviv -- 4 million; Poltava -- 3.4 million; Zhytomyr -- 3.3 million; and Cherkasy -- 3.2 million. Ryanair, Europes largest airline, rolls out its Ukraine service this week. By Tuesday, Ryanair will have direct flights from Kyiv Boryspil to 12 EU cities Barcelona, Berlin-Schonefeld, Bratislava, London-Stansted, Stockholm, Vilnius and six Polish cities: Bydgoszcz, Gdansk, Krakow, Poznan, Warsaw-Modlin and Wroclaw. By Friday, the discount airline will inaugurate flights from Lviv to five EU cities: Krakow, London-Stansted, Memmingen (120 km from Munich), Warsaw-Modlin, and Weeze (83 km from Dusseldorf). Planning on expanding in 2019, Ryanair officials met this year with officials of Kherson, Kharkiv and Odesa airports. The Dublin-based airline carries more international passengers than any other airline in the world. This market power is expected to open Ukraine to European tourism. Wizz Air started daily direct flights yesterday from Kyiv Sikorsky to Vienna. With this flight, Wizz Air offers direct flights from Sikorsky (Zhuliany) to 20 EU cities, including London-Luton, Lisbon, five Polish cities and eight German cities. On March 1-2, Wizz Air starts new flights to: Bremen, Riga, and Billund, Denmark. Switching from east to west, Ukrainian rail passengers now travel more to the EU than to Russia, Ekonomichna Pravda reports, quoting Oleksandr Krasnoshtan, deputy director of long distance passenger service. Popular destinations are Warsaw and Przemysl in Poland, and Kosice in eastern Slovakia. Yevhen Kravtsov, acting CEO of Ukrzaliznytsia, posts on Facebook that through August, passenger traffic hit 270,000, more than double the same period last year. ArcelorMittal, the world's largest steel company, plans to invest $1.5 billion in the Kryvvyi Rih mining and steelmaking complex through 2022, according to a company press release. Additionally, the company is investing $400 million this year in the Dnipropetrovsk plant. In the EU, the company is selling steel plants in a bid to buy the worlds largest steel mill, in southern Italy. In a surprise move, Ukraines State Regulatory Service, the body that approves acts of other state bodies, has rejected governments Oct. 19 decision to raise household gas prices by 23.5%.This gas hike, effective Thursday and a second one of 15% in May are linchpins in the staff level agreement reached with the IMF. The IMF agreement prompted the Finance Ministry to sell $2 billion in Eurobonds last week. The regulatory agency says the gas hike should have been preceded by one month of public debate, expert analysis of economic and social impacts, and a vote by the Rada Energy Committee. Dragon Capital writes: It is not clear if there are legal ways to salvage the resolution in the long term, but in the short term the government is likely to defend it in courts for as long as possibleProvided that the resolution is not immediately canceled in courts, we think therell be no immediate impact on cooperation with the IMF. Concorde Capitals Alexander Paraschiy writes: Given that this resolution was the result of a compromise with the IMF (apparently), we believe it's more likely that the Cabinet and State Regulatory Service will agree on its text so that it wont hurt the gas adjustment schedule and, therefore, Ukraines future cooperation with the IMF. Ukraine should end its state railroad and oil and gas monopolies, Morgan Williams, president of the US-Ukraine Business Council, said Monday at the start of a 2-day trade mission by 12 U.S. companies. You cannot you cannot have private locomotives it is holding up economic development, it is holding up grain storage development, he said, noting the Rada voted last week to retain Ukrzaliznytsias locomotive monopoly. On energy, he cited 4 to 5 funds of $250 million each that would invest in Ukraine if laws are changed to allow production sharing agreements protected by international courts. If these monopolies are broken up, he predicted: US companies could come in quick. Through September, Ukraines economy grew by 3.8%, compared to the same period in 2017,President Poroshenko said in a speech. The World Bank forecasts that Ukraines economy will grow by 3.3% in 2018. The IMF predicts 3.5% growth. President Poroshenko visits Turkey on Saturday to meet with President Recep Tayyip Erdoan in Ankara. Earlier this year, trade experts that this year end visit would see completion of a Turkey-Ukraine trade pact. However, there have been no recent hints. One of Turkeys largest e-commerce sites, hepsiburada.com, is taking steps to enter the Ukraine market, the Kyiv Post reports. Yaman Alpata, international group director, said the company is studying logstics and talking to marketing agencies. About 50 Swiss business executives participated last week in Zurich in a round table on Ukraine investment opportunities. It was the second such event in Switzerland this year, according to one participant, Lenna Koszarny, CEO of Horizon Capital. Separately, Intersport GmbH, the Bern-based sporting goods retailer, is opening its first multi-brand outlet store in Ukraine, at Kyivs Epicenter K. The 2,800 square meter store is located on the Kyiv Circle road, in northeast Kyivs Berkovetske suburb. Japans Sumitomo Group is buying a 51% controlling stake in Spektr-Agro and Spektr-Agrotekhnika, both based in Obukhiv, 50 km south of Kyiv. Founded in 2009, Spetkr-Agro distributes herbicides, pesticides, fertilizers, seeds and agricultural equipment for more than 3,500 farmers in Ukraine. As part of the drive to clean up the books of state banks, Arctic, Kyivs largest cold storage warehouse complex, is to be auctioned off on Monday. Starting with a floor bid of $7 million, SETAM is handling the electronic auction for Oschadbank, the State Savings Bank of Ukraine. As mini-privatizations draw increasing investor interest, seven buyers in Lviv got into a bidding war over a property called Wave Experimental Plant. The winner ended up agreeing to pay $2.1 million almost five times the asking price, reports the Lviv branch of the State Property Fund. Planning to privatize 30 of its 130 state-owned companies, Ukroboronprom, the state arms making conglomerate, has signed a cooperation agreement with ProZorro.Sale, the electronic auction house. Ukroboronprom is transferring to the State Property Fund the 30 businesses. All are deemed not essential to the conglomerates core mission -- building military products. To maintain freedom of shipping in the Sea of Azov, Ukraine is lobbying the US and the EU to threaten Russia with trade sanctions against its Black Sea ports, Infrastructure Minister Volodymyr Omelyan told reporters Monday on the sidelines of the US-Ukraine Business Council meeting. Since April, Russia has caused $35 million in damages to shippers and Mariupol port by detaining foreign merchant vessels in the Azov for inspections. Analysts say a clear candidate for sanctions is Novorossiysk, 150 km southeast of Kerch Strait. This ice-free port is Russias largest and the third largest in Europe by turnover. Ryanair executives fly to Kyiv in November to negotiate flights to new Ukrainian airports, the opening in Ukraine of an IT center and a Boeing service center, Minister Omelyan tells the Morning News. With the discount airline starting service this week from Kyiv and Lviv to a total of 14 EU cities, Omelyan said talks would revolve around Ryanair launching service from five more Ukrainian cities. Lines of cars, trucks and buses to cross the Ukrainian-Polish border have worsened in recent years, Ukrainian Foreign Minister Pavlo Klimkin tells Ukrinform. Ukrainians and Poles are not supposed to spend hours in line, and very often, eight, ten or 12 hours, he said. This affects lives and peoples business who live and work in Ukraine and Poland. About one third of the vehicles are owned by Ukrainians who need to regularly cross into Poland with their Poland-licensed cars to stay legal. Concorde Capitals Zenon Zawada: The Polish-Ukrainian border is an economic sinkhole for Ukraine, causing millions - if not billions - of dollars in damage in trade. The long lines for commercial vehicles, which truly can extend for several days in peak periods, is among the biggest hurdles to overcome for Ukrainians doig trade with EuropeKlimkin himself pointed out that Ukrainian produce often spoils simply because it stays in these lines for so long. Russia is putting in place the essentials for an economic blockade of Ukraines sea and river ports, warns Petro Tsigikal, chairman of Ukraines State Border Service. The prerequisites for the economic blockade of the sea and river ports of Ukraine are being created, he told a maritime defense conference in Odesa. Appealing to foreign powers to guarantee freedom of the seas, he said: Only joint actions are a guarantee of a strong and united Europe, in which Ukraine remains a reliable outpost on its eastern borders. In the Black Sea, Ihor Voronchenko, commander of Ukraines Naval Forces, said Tuesday that Russian coast guard patrols are radioing Ukraine-bound ships and asking captains their destination and cargo. Concorde Capitals Zenon Zawada writes: The escalating Russian pressure on foreign ships raises the prospects for an armed conflict eventually. In turn, the Russian government can use a single conflict, or a series of conflicts, to expand its military aggression into the Black Sea. With Europes richest deposits of lithium and cobalt, Ukraine can become the world's center for the production of batteries and electric cars, Infrastructure Minister Volodymyr Omelyan writes on Facebook. Omelyan is pushing the Rada to approve a bill allowing for a 15-year program to develop production in Ukraine of electric cars, buses, parts and batteries. With the EU moving toward electric vehicles, Omelyan foresees Ukraine creating a new high-tech industry and tens of thousands of new high-paying jobs." Ukraine has issued mining permits for two lithium fields -- Shevchenkivskiy in Donetsk, and Polokhivskiy in Kirovograd. No work has started as miners await approval of the new bill. Ukraines exports through August were up 12.4% yoy, to $30.9 billion, according to the Economic Development and Trade Ministry. Exports to the EU grew faster than the global average, increasing by 18.3% to $13 million. EU bought 42% of Ukraines exports through August. Separately, two-way trade between the US and Ukraine grew by 16% through August, reaching almost $2.6 billion, Stepan Kubiv, the minister, wrote on Facebook. Ukraines sunflower oil production and exports are to grow by 12% this year, forecasts Oil World, a German vegetable oil news site. During the 2018/2019 marketing year, Ukraine is to produce 6.4 million tons of sunflower oil, exporting 92% of the total. The worlds sunflower power, Ukraine produces almost twice as much as the entire EU. Schlumberger, the Franco-American oil services giant, is to provide $92 million worth of coiled tubing equipment and support for well workovers to UkrGazvyDobuvannya, the state oil and gas production company. Schlumberger Services Ukraine LLC also has committed to work with UGV to develop drilling, hydraulic fracturing, and 3D modeling. A French-Ukrainian company, MAIN Group Ukraine, plans to break ground this spring on a $100 million, 85 MW solar power plant in a Dnipro city suburb, reports Dnipro Mayor Boris Filatov. Located on 175 hectares in the Igren district, on the east bank of the Dnipro river, the plant is to provide 200 jobs after completion. Since 2015, the main shareholder of MAIN Group Ukraine is a French company, Ribour Participations, which is main owner of Ingeliance Group, a Bordeaux-based engineering company. About 3,000 homeowners installed rooftop solar panels through September, 2.5 times the rate of last year, reports the Energy Efficiency Agency. Separately, since 2014, 500,000 families have taken out arm Loans, paying for winterizing that cuts gas bills by 20 to 50%, the agency says. The problem of Ukraines energy inefficient Soviet era housing remains immense. This winter, 7 million households, roughly half the population, are to receive gas heat subsidies. In the latest battlefront between geeks and corruptors, ProZorro is applying a new software that uses 35 indicators to review all government tenders for potential fraud. Suspicious tenders are automatically forwarded to the State Audit Service for review. Maksym Nefyodov, first deputy minister of Economic Development and Trade, tells UNIAN: It's even more suspicious when several indicators are triggered simultaneously." Ukraines top business leaders are ranked in a new survey published by Korrespondent newsweekly. The top five are: Alexander Bulba, general director of Nova Poshta; Alexey Vadatursky of Nibulon; Igor Smelyansky of Ukrposhta; Volodomyr Lavrenchuk, of Raiffeisen Bank Aval; and Musa Magomedov, of Avdiivka Coke and Chemical Plant. Last Mays opening of the $100 million, double track Beskyd rail tunnel through the Carpathian mountains resulted in an immediate 5% increase in freight traffic on that key line connecting Ukraine with the EU. By ending a bottleneck caused by the 1886 single track tunnel, train speeds increased to 60 km/h and 627 million tons were carried July through September, up 32 million tons from the first quarter, reports Yevhen Kravtsov, acting CEO of Ukrzaliznytsia. Kyivs train to the plane will run around the clock, Ukrzaliznytsyas Kravtsov tells LIGA.net. With service to Boryspil Airport to start at the end of this month, peak hour frequencies will be every 40 minutes and off peak every 90 minutes. Boryspil, responsible for two thirds of Ukraines air traffic, works around the clock. For example, this morning, between 1 and 6 am, 15 flights were scheduled to depart. Reikartz, the Belgian-Ukrainian hotel chain, starts managing today its latest 37th hotel in Ukraine, the VitaPark Stanislavisky, in Yaremche, the historic Carpathian mountain resort town. Located midway between Ivano-Frankivsk city and Bukovel ski resort, the hotel has 54 rooms today. Next summer, the hotel will add 130 rooms, says Andriy Dema, operating director of the Reikartz Hotel Group. Founded in Lviv in 2003 by Francois Ryckaerts and Belgian architect friends, the Reikartz Group has expanded beyond Ukraine, managing three hotels in Germany and two in Sweden. Ukraine proposes to China creating a bilateral free trade pact. Stepan Kubiv, Economic Development and Trade Minister, proposed the pact yesterday in Beijing in a meeting with Liu He, a Deputy Prime Minister who is also vice chairman of the National Development and Reform Commission. Earlier in the week, Liu, a Harvard-trained economist, visited the Ukraine stand at the China International Import Expo in Shanghai. With China trade with Ukraine expected to hit $8.5 billion this year, Kubiv predicts it will hit $20 billion in the next five years. Kubiv made the proposal with the backing of President Poroshenko. In a letter he delivered to Liu, Poroshenko said China and Ukraine have today created a strong foundation in bilateral relations and its time to start a new phase in developing the relations between our people. After the meeting, Kubov posted on Facebook that China is a natural next step, writing: There is a new free trade agreement with Canada, completed free trade negotiations with Israel. We are completing negotiations with Turkey. Chinas reaction is unclear. Xinhuas report, headlined Chinese vice premier meets Ukraine's first deputy PM, did not mention Ukraines free trade proposal. In Shanghai, China signed a draft loan agreement for construction of a highway bridge over the Dnipro, near Kremenchuk, Ukraines Infrastructure Ministry reports. Under discussion for two years, the one kilometer long bridge would bypass Kremenchuk, ending a bottleneck between Poltavas grain belt and the Black Sea ports. China will import more sunflower oil and meal from Ukraine, under a deal signed Tuesday in Shanghai by Chinese state company CCEC and Ukraines State Food and Grain Corporation. Sunflower oil is used largely for frying food. Sunflower meal, the residue of crushed seeds, is rich in protein and dietary fiber. It typically is used as an animal feed. In the recently completed marketing year, Ukraine, the worlds largest sunflower oil exporter, sent to China 9% of its oil exports and 4% of its meal exports, Reuters reports. Exports of organic grains peas, wheat and corn are expected to drop by one third this year, to 115,000 tons, APK-Inform forecasts. Several farms have lost their organic certifications. Czech interest in investing in Ukraine is huge, Radel Matula, the Czech Republics ambassador to Ukraine, said yesterday at a press conference at Ukrinform. This year, we have organized several business forums in Ukraine, which shows that Czech businessmen are interested in cooperation with Ukrainian partners, he said. The interest is huge. Running short of labor, the Czech Republic streamlined the process this year of issuing work permits to Ukrainians. Last year, bilateral trade increased by 29%. This year, first quarter trade was up 35%, to $426 million. 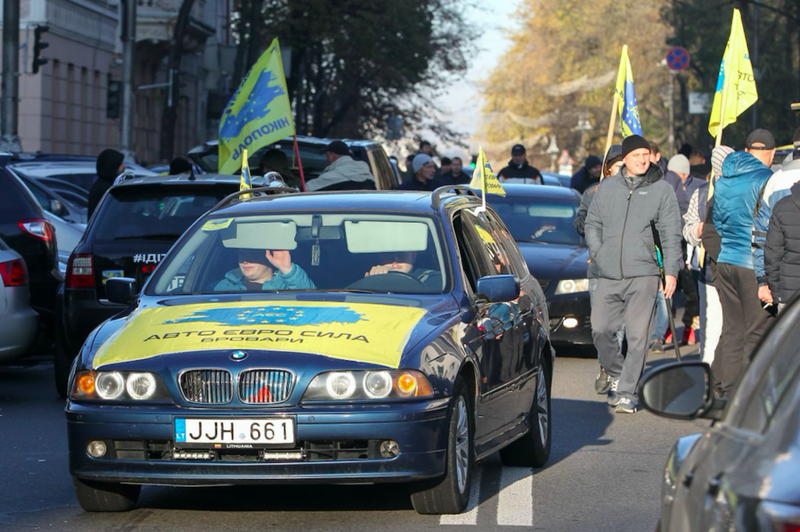 After two days of car owner protests blocking streets outside parliament, the Rada approved a law that lowers excise taxes on imported cars and gives car owner 90 days to regularize their cars at discounted rates. In a new duty structure that could spark a greater wave of used car imports, the excise duty on cars up to five years old will be 400 to 600 euros. With Germany restricting diesel cars, many of these used cars are expected to go to Ukraine. Despite these concessions, Interfax-Ukraine reports that car owners shouted obscene language towards the parliament building, as well as the word "ganba!" or shame! Fueling anger is Ukraines enduring status as Europes poverty pocket of low car ownership 202 cars per 1,000 people. Among neighboring states, the rates are: Romania - 329; Hungary - 338; Belarus - 362; Russia - 369 and Poland 571. Construction of $35 million, 40 km rail line is the solution to Russias refusal to allow coal shipments from DTEK coal mines in Russia to DTEKs power plant in Luhansk, Dmitry Saharuk, General Director of DTEK Energy, tells reporters in Dnipro. With the energy security of the 1 million residents of government-controlled Luhansk at stake, DTEK asks Ukrzaliznytsia to build the spur line, a one year project. Earlier this week, DTEK ran out of coal and switched to gas, a move that will cost local electricity users $10-20 million a month. Yuri Nedashkovsky, President of Energoatom, tells Interfax-Ukraine that he does not see any risk that Russia will stop enriching uranium from Ukraines VostGOK mines in Dnipropetrovsk. The company is on the Kremlins new Ukraine sanctions list. Enriched uranium fuels Ukraines 15 nuclear reactors, source of half of Ukraines electricity. Last year, President Poroshenko promised in Washington to phase out imports of nuclear fuel from Russia, opting to import from Westinghouse Electric Sweden. But six months later, in a new Energoatom contract, Westinghouse was allotted only one additional reactor, meaning that Russias Rosatom is to supply 54% percent Ukraines nuclear fuel through 2025. Russias sanctions are forcing UIA to suspend its flights from Kyiv to Astana until May. Russias ban on overflights by Ukrainian carriers forces Ukraine International Airlines to make a two hour southern detour to get to Kazakhstans capital. The airline also blames the cost of jet fuel, up 40% over last year. Air Astana flies three times a week from Boryspil to Astana, making the flight in 4 hours 30 minutes. Last year, 2.5 million Ukrainians spent almost half a billion dollars on the services of Ukrainian tour operators. Of vouchers sold, 94% were for travel abroad, reports the Regional Development Ministry. Ukraines top five operators are: Join Up! 703,400 clients; Anex Tour 453,800; Travel Professional Group 240,700; TEZ Tour - 233,700; Coral Travel -199,800; and TUI Ukraine -136,200. With Ryanair and Wizz Air turning Kyiv and Lviv into weekend city break destinations for EU residents, Ukraines Economic Development and Trade ministry is mounting Ukraine stands at three EU travel fairs this month. After participating this week in the World Travel Market in London, the Ukraine stand moves Nov. 22 to the International Travel Show TT in Warsaw. The following week, it will be at IBTM World in Barcelona, from November 27 to 29. To speed Chinese goods to the EU, China plans to invest in three truck-train cargo hubs in Western Ukraine, Viktor Dovhan, deputy infrastructure minister, reports after two days of meetings in Beijing with Chinese officials, including Vice Premier Liu He. Ukrzalyznytsia wants to build European gauge track to three western rail hubs Kovel, Lviv and Uzhgorod. For meetings about these multimodal hubs, Chinese officials had done their homework, citing the number of containers going recently from Ukraine to Austria 6,500. COFCO, or China National Cereals, Oils and Foodstuffs Corporation, plans to invest up to $30 million to upgrade shipping berths in Mykolaiv port and to improve grain logistics on the Dnipro and the Southern Bug rivers, the Infrastructure Ministry reports from Beijing. China Railway International Group has completed its feasibility study for Kyivs fourth subway line, says Dmytro Davton, deputy head of Kyiv city administration. In Beijing last week, officials of the state-controlled rail construction group gave him the study, Interfax-Ukraine reports. Mayor Klitschko says construction of the fourth metro line will begin after the 2021 completion of the Podilsko-Voskresenskyi Bridge, the 7 km road-rail bridge started in 1995. Metro construction would last through 2026, and would cost $2 billion, with 85% financed through Chinese loans. The EBRD has signed a $150 million long term loan agreement with Ukrzaliznytsya to allow the state railroad to buy up to 6,500 gondola freight cars for moving bulk cargo, typically grain. An international tender for a first group of cars is out and first deliveries may be made next month, Yevhen Kravtsov, acting board chair of the railroad, writes on Facebook. The cars are to go to a UZ subsidiary company which will put them up for rent, establishing a rate for freight cars. Cheap corn from Ukraines bumper crop is taking sales from American corn, warns Farm News, a news site based in Fort Dodge, Iowa. The Ukraine Grain Association recently raised its harvest estimate to 35 million tons, 13% higher than the USDA estimate for Ukraine. Currently U.S. corn values are being undercut by Ukraine and Brazil corn, Farm News reports. Relief for American corn may come, the site says, due to logistical concerns in Ukraine, a reference to state railroad bottlenecks. Ukraine, the worlds largest sunflower oil and meal exporter, increased its sunflower seed crop this year by 9.5%, to 15 million tons, according to a new forecast by the USDA. From this crop, oil exports will grow by 5%, to 5.6 million tons, and meal will grow by 6% to 6 million tons. US Energy Secretary Rick Perry meets in Kyiv today with US business representatives at the Intercontinental Hotel, with Rada members next door, at the Diplomatic Academy, and with Prime Minister Groysman at the Cabinet of Ministers. On Sunday, at Kyivs monument to the Heavenly Hundred, Perry said that the US companies and the US government are ready to work for Ukraines energy independence. Russias state-controlled TV often used to prepare public opinion for future Kremlin actions is talking of plans to cut gasoline and diesel supplies to Ukraine right before the presidential election, TSN.ua news site reports, citing talk shows in Moscow. Of Ukraines six refineries, two Odesa and Kherson are closed. The others work at low volumes. The largest Ukrtatnafta, in Kremenchuk, is controlled by Russias Tatneft and allied companies, a shareholding structure contested by Naftogaz. Earlier this month, Russia stopped supplying coal to DTEKs thermal power plant in government-controlled Luhansk. Last week, Yuri Nedashkovsky, President of Energoatom, told Interfax-Ukraine that he is confident that Russia will honor contracts to supply fuel to the nations nuclear power plants, source of half of Ukraines electricity. On Saturday, US Energy Secretary Perry visited a stockpile of Pennsylvania coal at Kyiv regions Trypilska Power Plant and said: Its very important for the European membership countries to understand that Russia has a history of cutting off gas supplies, and that having these alternative sources of supply are important for the future development of Europe. More than 200 km of the Nord Stream 2 or almost 20% of the 1,200 km pipeline -- has been laid in German and Finnish waters of the Baltic, Paul Corcoran, CFO of the Nord Stream 2 operating company, told a Berlin gas conference Thursday, according to S&P Global Platts. He said the project is on track to be completed one year from now and predicted that flows will ramp up gradually in through 2022. Asked about future flows of Russian gas through Ukraine, he predicted: "There will be some continuing transit through Ukraine, the question of how much that is varies." He pointed to estimates of future Ukrainian transit of Russian gas of 10-40 bcm/year. Last year, Ukraine pipelines carried a net 79.4 bcm of Russian gas to the EU, earning Naftogaz about EUR 3 billion. With Gazproms transit contract with Naftogaz due to expire at the end of next year, the Russian state gas company shows "no appetite" in taking part in talks brokered by the European Commission, Olena Zerkal, Ukraine's deputy foreign minister, told the gas conference. She said Ukraine is proposing to Gazprom a 70% cut in transit tariffs, Platts reports. If signed into law by President Poroshenko, a bill cutting excise taxes on used cars imports will result in a doubling or tripling of used car imports from the EU, and a 20-40% cut in the new car sales, Sergey Borovik, AIS Group Marketing Director, predicts to Interfax-Ukraine. So far this year, 226,000 cars were brought in Ukraine in transit or temporary admission mode, reports the State Fiscal Service. About half of these have violated their terms of stay. The bill passed Thursday by the Rada cuts import excise duties in an effort to encourage owners to legalize their cars. Contactless payments with smartphones increased nine fold during the first three quarters of this year, compared to the same period last year, according to the Ukrainian Processing Center, a company that provides processing services and software for banks. Of the more than 500,000 payments made, 48% were at supermarkets, 19% at restaurants, 15% for subway rides, 5% at gas stations, and 2% at pharmacies. The average charge was UAH 176, or $6.30. The EU is committing EUR 50 million in aid to government-controlled Donbas, targeting entrepreneurs and universities that have relocated from the Russia-controlled area. The agreement was signed Friday in Kyiv by Johannes Hahn, European Commissioner for European Neighborhood Policy, and Osnat Lubrani, United Nations Development Program representative here. Ukraine can be the Texas of Europe, US Energy Secretary Rick Perry told representatives of American businesses in Kyiv on Monday. The [oil and gas] formations that are here the potential for the development of those is, I think its staggering, said Perry, who served as governor of Texas from 2000 to 2015. There are very bright and capable geologists that talk about Ukraine potentially having fields as big or bigger than what we see in the United States. In one decade, innovative technology and industry friendly laws took US from defeatist peak oil talk to the worlds largest oil and gas producing nation, Perry said. For Ukraine, the keys are: production sharing agreements, liberalized and transparent energy markets, and the separation of the pipeline and production arms of Naftogaz. The former leader of Americas premier energy state concluded his pep talk, saying: The [energy] potential for Ukraine is stunning. Oil and gas production sharing agreements, international arbitration clauses, and bigger exploration lots will attract American energy companies, says Morgan Williams, president of the US-Ukraine Business Council, one of the sponsors of the Monday business meeting. With these changes, we know of four to five U.S. companies that would come here instantly with the latest technology, he told the Morning News. At the end of a 3-day visit to Ukraine, Perry stressed that the US government and companies will be strong allies and strong partners with Ukraine in the nations effort to win energy independence from Moscow. Russias use of energy as a weapon is unacceptable, said Perry who gave a similar message on his earlier stop, Poland. The stability that energy security brings to the region cant be overstated. Speaking to Prime Minister Groysman, he said: The citizens of Europe, the citizens of Ukraine in particular, should never be held hostage by a single source of energy. In a liberalizing step that coincides with Perrys visit, the Cabinet of Ministers approved last week placing geological information on line. The Better Regulation Delivery Office, an advisory group, says: "It will be easy to find the right geological information soon: it will be online. What will it give us? First, information about the private geo information will be recorded in the Catalog of Geological Information. As part of the change, private companies no longer need government permission to sell seismic survey and other data they have collected. The EBRD plans to loan up to EUR 52 million to UkrGazVydobuvannya to pay for modern workover rigs to get more gas out of old wells. Pending EBRD Board approval Dec. 12, the money also will help the state company buy modern equipment for the recovery of waste heat during gas processing, reducing carbon dioxide emissions. NASA will launch on Thursday the latest Ukrainian-made Antares middle-class launch vehicle, designed to supply the International Space Station. The launch, from NASAs Wallops Flight Facility in Virginia will be the 10th of an Antares rocket and the first since May. Designed by Pivdenne Design Bureau, the first phase of the Antares rocket is made by Pivdenmash in Dnipro. Participating Ukrainian companies are: Hartron-Arkos, Hartron-Ucom, Rapid, and Chezara, of Chernihiv. The US contractor is American Orbital ATK, now called Northrop Grumman Innovation Systems. Local budgets will increase 21% next year to $10 billion, from $8.25 billion this year, predicts Gennady Zubko, minister of regional devlopment. This would match a similar increase this year. This unprecedented budget money comes from the governments decentralization program and revenue sharing between the capital and the 24 regions. Little appreciated inside Kyivs Ring Road, this surge of money across the country is expected to help President Poroshenko in his March 31 re-election bid. After a slow start, work is to begin in earnest in April on the $48 million, Chinese-built, concrete bypass road around Zhytomyr, says Infrastructure Minister Volodymyr Omelyan. After inspecting the site and talking to representatives of the construction company, Sinohydro Corporation Limited, Omelyan said the work will be completed in June 2020, two years after it began. Landlocked Belarus could become a maritime state with the construction of a Dnipro river port in Nizhny Zhary, in Belarus southernmost tip, according to Andrei Savinykh, Belarus ambassador to Turkey. Last week, Savinykh showed representatives of Turkeys Derin Shipping & Trading Co., around Nizhny Zhary, a Gomel region village of dirt tracks and shuttered wooden cottages on the eastern edge of the Chernobyl exclusion zone. Located one kilometer north of the confluence of the Pripyat and Dnipro Rivers, the international borders with Ukraine, Nizhny Zhary now is used as the last anchorage for river barges on Belarus territory. Currently 10 km from the nearest paved road, Nizhny Zhary would be transformed in the 2020s with a multi-million dollar river terminal where seaworthy river boats could be loaded with Russian oil and Belarussian potassium chloride. After Canada and Russia, Belarus is the worlds third largest producer of potassium, the primary ingredient for potash fertilizers. With an eye on developing a Nizhny Zary-Black Sea link, Nibulon, Ukraines largest river transport company, signed a partnership memorandum with Gomel last year. Chernivtsi is Ukraines latest fast growing regional airport to attract development plans. With the draw of a UNESCO World Heritage Site the Hapsburg-era National University Chernivtsi is seeing its traffic grow by 50% this year, to 75,000 passengers. UIA, which has the sole scheduled flight, last year doubled the size of its aircraft on the daily route from Kyiv, to a 100-seat Embraer 100. Now, Infrastructure Minister official Yuri Gusev writes on Facebook, the government plans to work with consultants from the World Banks International Finance Corporation to draw up a public private partnership plan to rebuild the 85-year-old terminal, built when the region was part of Romania. Chinas UnionPay, the worlds largest card payment company, has won permission from the National Bank of Ukraine to operate in Ukraine. The central bank authorizes Ukrainian banks to issue UnionPay cards. Last July, UnionPay president Shi Wenchao met in Kyiv with central bank governor Yakiv Smoliy and his first deputy, Kateryna Rozhkova. Corruption depresses Ukraines annual growth by two percentage points, Goesta Ljungman, the IMF Representative in Ukraine told reporters on Tuesday. The Economy Ministrys consensus forecast for 2018 GDP growth is 3.1%. Of course, economic growth by 3% per year is better than the 10% decline that Ukraine underwent in 2015, said Ljungman, a Swede. But, if you look at the context, the developing countries of Europe are now growing at an average of 4-5% per year, which indicates insufficiently rapid restoration of Ukraine. The consensus forecast for next year is 3%. Inflation should drop to 6.2% next year, a fall that should pull down interest rates, the IMF Representative predicted. "The level of interest rates currently stands at more than 18% per annum, he said. Obviously, under such conditions it is difficult to finance investments by borrowing from a bank. The way to solve this problem is to reduce inflation." Chernobyls first wind park will be built next year, according to Ostap Semerak, Minister of Ecology and Natural Resources. Polesky Wind Park LLC won permission last week to build a $5 million, 4.5 MW wind turbine cluster on seven hectares near the deactivated nuclear plant. Ukraines strongest and most consistent winds are atop the Carpathians and along the shores of the Black Sea and the Sea of Azov. But Chernobyl, largely for symbolic reasons, has drawn more than 60 renewable energy proposals. Last month, Solar Chernobyl, a German-Ukrainian company, inaugurated the first solar plant in the exclusion zone, a $1.2 million, 1 MW installation. The minister writes on Facebook: The Chernobyl zone is a territory of change. Ukraines exports of frozen fruits and berries are up by 32% this year, earning exporters 45% more money, reports EastFruit news site. For the first five months of the season that started in June, exporters sold 31,300 tons, earning $53 million. Applying Dnipro experience to the Nile, Nibulon is starting a 10-year, $2 billion project to upgrade Egypts river cargo transport system, the company reports. The project is to involve building grain silos and elevators and twenty 20,000 ton river barges in Egyptian shipyards, reports Oleksiy Vadaturskiy, the companys general director. Though the end of next year, Nibulon is to invest $200 million. The company notes that over the last decade, it exported 12 million tons of Ukrainian wheat, corn, sorghum and soybeans to Egypt. Spetstechnoexport, Ukraines state owned arms sales company, has opened its second office in India, after New Delhi, the capital. The new office is in Nashik, an aerospace manufacturing hub 170 km northeast of Mumbai. Nashik is home to Hindustan Aeronautics Limited, which nearly tripled its business this year with Spetstechnoexport, compared to 2016 levels. Last April, at Indias DefExpo 2018, Spetstechnoexport signed new aviation contracts worth $20 million, UkrOboronProm reports. During the Cold War, India received many of its arms from the Soviet Union, with much materiel coming from factories in Soviet Ukraine. Two more industrial parks one in Dnipro, the other in Mykolaiv joined the governments register of ndustrial parks. Of the nations 35 industrial parks, half have management companies, reports the Economic Development and Trade Ministry. Dnipros Innovation Forpost Park, registered for 45 years, is to specialize in production of electrical equipment, computer services and metallurgical products. Mykolaivs Energy Park, registered for 30 years, is to focus on production of food and beverages, rubber and plastic products, building materials, glass, chemical products, and finished metal products. Kyivmetrobud, the state company that has built the Kyiv Metro since 1949, submitted a winning $214 million bid to build a 9 km, three station northern extension of the Green Line. Running from Syrets to Vynohradar, a neighborhood west of Obolon, the line would have three new stations, Mostytska, Pravdy and Vynohradar. Work is to be completed by the end of 2020. Last year, metro ridership was up 2.8%, to almost half a billion rides. Wizz Air has doubled its Ukraine passenger traffic this year, carrying 1.2 million passengers through October. Currently, the largest low cost carrier for Ukraine, Wizz Air plans to base a fourth Airbus 320 next year at its base at Kyiv Sikorsky (Zhuliany). On March 1-2, it plans to start flights from Kyiv to three new cities: Bremen, Riga and Billund, Denmark. From Lviv, it starts service Dec. 14 to Frankfurt-Hahn, and on March 3 to Copenhagen. From Kharkiv, it started service to London-Luton yesterday. Flights to Vienna start Nov. 25. By March, the Budapest-based airline will fly 42 routes to 12 countries from three Ukrainian cities. Through September, air traffic in Ukraine is up 24% yoy, to 15.6 million. Kyiv Sikorsky lead the nation, with a 57% growth in passengers. Among the regional hubs, the biggest growth is at Lviv. There, passengers through October are up 46% to 1.3 million. Flights from Kyiv to Uzhhorod should start next month, Infrastructure Minister Volodymyr Omelyan reports after meeting with European Aviation Safety Agency officials. The airport was closed two years ago for upgrades to comply with EU requirements. With the Uzhhorod runway ending a few meters short of Slovakias border, all takeoffs and landings use Slovakian air space. Until July 2016, Motor Sich served the route, covering the 630 km in about one hour -- compared to 12 hours by train. Despite the investments in Uzhhorod airport, the ministry plans to make Mukachevo 45 minutes to the east the main airport for Zakarpattia for the 2020s. A former Cold War air base, Mukachevos abandoned airfield features a 2.5 km runway with steel rebar rusting through broken concrete. Omelyan predicts that in 2019-2020, the Infrastructure Ministry will get budget money to completely rebuild the runway and to build an international terminal. The other option was to build a completely new airport in Khust, a two-hour drive east of Uzhhorod. To soothe relations with Hungary, a major source of tourism and investment, Hennadiy Moskal, head of Zakarpattias government, assured the regions Hungarian-speaking minority that they can now get Hungarian passports at Kisvrda, a Hungarian city 30 km south of the border. Last month, Ukraine expelled the Hungarian consul from Berehove, a Hungarian-speaking city in Zakarpattia, after a video surfaced of consular officials issuing Hungarian passports to Ukrainians. Nothing has changed. They changed the issuing place to Hungarian city Kisvrda. People can take a suburban train, which reaches the city in seven minutes, and they are accepted there, Moskal said on 112 Ukraine TV. If we are going to Europe, our motto is no borders. Naftogaz postponed Wednesdays placement of $500 million in Eurobonds. Although $700 million in bids were made for the 5-year bonds, they came in higher than the 10.9% target interest rate. Wednesdays 7% drop in oil prices hurt energy assets across the board. Last week, in advance of the energy companys Monday-Tuesday road show, Fitch Ratings gave the bonds a B- rating. On Tuesday, Naftogaz CEO Andriy Kobolev told a conference in Kyiv that he wants to replace the state energy companys $2 billion debt portfolio with lower interest rate Eurobonds. The aborted sale is expected to push Ukrzaliznytsya to postpone its own Eurobond placement. Timothy Ash writes from London: Unfortunately Ukraine now is paying the price for the long delay in getting IMF lending back on trackit says the market is: a) untrusting of the commitmentto the IMF program; b) worried about the bunching of borrowing in the run up to elections; c) those elections themselves and the uncertain outcomeThe plus factor from the above is that the message from the market is now loud and clear - we will only finance you if you stay on track with the IMF. With the first snow falling on much of Ukraine Wednesday, about 1 million people were without heat as regional utilities were locked in payment disputes with Naftogaz. In Kriviy Rih, residents seized the local gas company headquarters. In Smila, in Cherkasy region, residents blocked an international highway. Prime Minister Groysman threatened to get the Rada to fire mayors who do not turn on the heat. At the end of the day, the Cabinet of Ministers banned shutting off gas to heat supply companies this winter. Last week, Yulia Tymoshenko, the populist presidential candidate, rose in polls after she harshly criticized the Nov. 1 gas price hike. The old game of selling gas to factories at household rates still costs Naftogaz about $350 million a year, Andriy Kobolyev, the company CEO, said Tuesday at conference organized in Kyiv by Nobles Fortune, the consulting company. Although abuses have largely ended, middlemen companies still manage to sell 1-2 billion cubic meters of subsidized household gas every year to companies, the Kyiv Post reports. So far, the Rada rejects legislation to make public the names of companies buying cheap gas from the intermediaries. The government boxed the ears of UkrGazVydobuvannya on Wednesday, saying the state company is falling behind in the governments $4 billion, 5-year investment program designed to produce 20 billion cubic meters by 2020. Last year, UGV produced 15.3 bcm of gas, or 74% of Ukraines total. Vice Prime Minister Volodymyr Kistion urged the Naftogaz subsidiary to accelerate measures to intensify production, which give faster and more timely results: more wells, more hydraulic fracturing operations, more booster stations - more commodity gas. UGV plans to commission 87 wells this year. Thirteen, or 15%, are by outside contractors. Next year, it plans to drill 131 wells. For comparison, from 2007 to 2014, the annual average was less than half - 55 wells. New drilling rigs from China and Germany are arriving in Ukraine, renewing gas production equipment that is the oldest in the region. On Monday, two rigs, each capable of lifting 450 tons of pipe, arrived in Odesa from Sichuan Honghua Petroleum Equipment, in central China. UGV reports it plans to buy eight more rigs from the Chinese company. Last month, in a $110 million deal, UGV received the first of five 450-ton rigs from Germanys Bentec GmbH Drilling & Oilfield Systems, reports Interfax-Ukraine. UGV Chair Oleh Prokhorenko says the average age of his company rigs is 23 years, compared to 10 years in Russia and nine years in Belarus. DTEK Naftogaz, a privately held compny, plans to increase its natural gas production by 10-12% next year, to 1.8 billion cubic meters, Yulia Borzhemskaya, the companys regulatory manager, told an energy forum in Kyiv. Ukraines third quarter GDP growth was 2.8%, compared to the same period last year. This was the lowest growth of the year, according to the State Statistics Service. First quarter growth was 3.1%. Second quarter growth was 3.8%. This is 11th quarter in a row of growth. The Economic Development Ministrys consensus forecast pegs 2018 growth at 3.1% and 2019 growth at 3%. Inflation in Ukraine will drop next year to a single figure, for the first time since 2013, according to 15 analysts surveyed by Reuters. Due to tight monetary and fiscal policies that meet the IMF requirements, inflation could fall to 7.5% from 10% expected for 2018, and 13.7% recorded last year. Ukraine registered a $3.5 billion trade deficit in goods and services through September, about three times larger than the deficit for the same nine months last year, reports the State Statistics Service. So far, exports of goods and services grew by 9% to $42 billion. Imports of goods and services grew by 15% to $45 billion. For goods alone, Ukraines exports to the EU grew by 16% to $14.6 billion, while imports from the EU grew by 13%, to $16.9 billion. Exports of goods to Russia fell by 7.5% - to $2.7 billion, while imports of goods from Russia grew by 21% to $5.8 billion. Russias Nov. 1 sanctions dont affect goods imports from Ukraine, Interfax reports from Moscow. An anonymous source in the financial-economic section of Russias government says the Nov. 1 resolution only affects financial relations and doesnt impose a ban on trade agreements involving third parties. Concorde Capitals Zenon Zawada writes: This report confirms that the Russian government is just as concerned about lost trade with Ukraine as Ukraine is with lost trade with Russia this is the latest of many signals that the Russian elite is actually nervous and acting with great caution. The US and EU are seriously discussing imposing sanctions on Russian ports to pressure the Kremlin to stop harassing merchant ships going to Ukraines ports in the Sea of Azov, Ukraines Infrastructure Minister, Volodymyr Omelyan, tells Ukrainian TV. Sanctions on Russian ports in the Sea of Azov are now being seriously discussed -- and I hope that it will also be in the Black Sea region, he says. By detaining a ship for a day, Russias Coast Guard imposes additional costs of $15-30,000. The logic is very simple - they increase the price of logistics, he said, adding the cost of delays since mid-April totals $35 million. [The EU] realized that, due to the Russian blockade, European taxpayers pay more for Ukrainian goods. Harvest reports indicate that Ukraines total grain production will hit a record of 70 million tons, up 14% over last year, reports Dragon Capital. Last year, the harvest was 51 million tons. In 2016, it was 66 million tons, then a record. Farming and food processing accounts for 17% of Ukraines GDP, Prime Minister Groysman said on Thursday, The Day of the Farmer. This year, India is the largest buyer of food made in Ukraine, purchasing 10% of exports. As a group, the EU buys 31.5% of Ukraines food exports. Trading places: Mykolaiv is overtaking Odesa, the iconic Black Sea port, to become Ukraines second busiest port. Through October, Mykolaiv handled 22.5 million tons of cargo, up 17% over the same period last year. Through October, Odessa port handled 17.3 million tons, down 13%. Odesa port, now Ukraines third ranking port, has been hurt by corruption reports and by the departure last spring of Maersk, the worlds container ship company. Maersk moved operations 40 km to the east, from Odesa to Yuzhne, Ukraines largest port. Mykolaiv rail station is a prime candidate for a public private partnership, Infrastructure Minister Volodomyr Omelyan says. In March, Ukrzaliznitsya starts a two-year, internationally funded project to electrify two lines of track, totaling 300 km, that converge on Mykolaiv in a V. Already a rail hub, Mykolaiv has nightly trains from Kyiv and daily trains to Odesa, to the west, and Kherson, to the east. Unimpressed with the condition of the rail station on a visit this week, Omelyan told his press service about broken toilets and the stationmaster who checked into a hospital so as not to show the results of his work for the year. PepsiCo Ukraine is building a Lays potato chip production line at its Mykolaiv region food processing plant. Due to open next summer, the plant would consume about 50,000 tons of potatoes. PepsiCo will supply regional farmers with seed potatoes of varieties suitable for chips and training by company agronomists. PepsiCo Ukraine CEO Iryna Kozlova said: Today we are preparing to install the first line for the production of potato chips. Currently, PepsiCo only makes Lays potato chips in Poland. According to PotatoPro news site, Ukraine is the worlds fourth producer of potatoes, producing 22 million tons, 2.5 times Polands production. Unibep SA, one of the Polands largest construction companies, has signed a EUR 35 million contract to complete a shopping entertainment center on northern Kyivs Pravdy Street. The center, Retroville, would be completed in the spring of 2020, shortly before a new Green line metro station is to open on Pravdy Street. Unibep, located in eastern Poland, is rebuilding several road sections for Ukravtodor. In the construction contract with Lithuanias Martin LLC, Unibep is to provide 15% of the financing and Polands Bank Gospodarstwa Krajowego is to loan the remaining 85%. The share of Ukraines exports going to the EU has increased from 25% four years ago to 42% today, Hugues Mingarelli, head of the EU Delegation to Ukraine, told DEF-2018, the Dnipro economic forum. He said: We believe that the best way to unleash the potential of Ukraine is to enable it to integrate into the EU market. For the fourth year in a row, Ukraine is increasing electricity exports to its Western neighbors.Through October, Ukraine exported $266 million worth of electricity, 27% more that during the first 10 months of last year. In order of importance, electricity buyers from Ukraine are: Hungary, Poland, Moldova, Slovakia and Romania. Concorde Consulting will be the lead advisor for the privatization of Kyivs President Hotel, a 374-room landmark that stands on a small hill a 10-minute walk from Parus and Gulliver business centers. Opened in 1990 as Intourist hotel, the hotel is one of 10 big privatizations that the government hopes to carry out in 2019. Concorde, which is based in Parus, will work with KPMG as auditors, Marcus Bureau as assessors, and Redcliffe Partners as lawyers. Privatizations of five big state companies are being blocked by court action taken by losers of tenders for consulting work on the sales. On Nov. 28, an appellate court will hear the arguments against the process used by a commission formed by the State Property Fund, the Finance Ministry, and the Economic Development and Trade Ministry. Vitaliy Trubarov, head of the Property Fund, says he hopes all the groundless accusations will be overturned by the court. Alexander Paraschiy, analyst for Concorde Capital, winner of several tenders, writes: Such a blockade might be only the beginning of the sabotage of the privatization process by forces that are controlling large state assets in Ukraine and milking them. Market instability was cited by Andriy Kobolev, Naftogaz CEO, as the key reason for postponing placement this week of $500 million worth of 5-year Eurbonds. He wrote on his Facebook page on Thursday: The high potential cost of raising funds in international markets make the issuance of five-year debt obligations impractical. Tim Ash writes that an unfriendly international bond market now forces Ukraine to play ball with the IMF: The market and the official financing sector are dovetailing together to continue to put pressure on policy makers to hold to an orthodox policy agenda. As e-commerce reaches Slavuta, 400 km west of Kyiv, Epicenter K is devoting 15% of their new shopping center in the Khmelnitskyi region city to a sports complex: basketball, volleyball, futsal, tennis, weightlifting, table tennis, boxing areas and exercise equipment. With e-commerce growing annually by 30%, shopping center designers predict that anchor retail tenants will shrink, sometimes becoming display centers for products sold online. This fall Epicenter K is opening five new stores, for a total of 53. New stores are in small cities, like Slavuta, population 35,000. Last fall, Epicenter K recorded sales of $1.5 billion in sales. Weeks before the official start of campaigning, the Presidential election is boosting the advertising industry. From April through September, Yulia Tymoshenkos campaign spent $3.5 million on TV and billboard ads, reports the Committee of Voters of Ukraine. For every dollar spent on outdoor, almost three dollars were spent on TV, according to the Committees analysis of financial reports by the Batkivshchyna All-Ukrainian Union. Tymoshenkos Fatherland party is buying TV ads through Global Media Group Ltd and Starlight Brand Content Ltd. Billboard ads are bought through RTM-Ukraine. Tymoshenko consistently leads in opinion polls. On Monday, Tetiana Slypachuk, chair of the Central Elections Commission, reminded candidates that campaigning for the March 31 vote officially starts in December 31. Russia could cut off Ukraines access to the Sea of Azov in minutes, a key Russian legislator threatened after Ukraines Border Guard Service detained 15 ships at Berdyansk and Mariupol on suspicion that they docked earlier in Crimea. Franz Klintsevich, who sits on the defense committee of Russias Federation Council, made the closure threat on Friday. By some estimates, 10 percent of Ukraines seaborne trade goes through the Azov. Since the summer of 2014, Ukrainian law holds that Crimeas ports -- Yevpatoria, Kerch, Sevastopol, Feodosiya, Yalta are closed. Any vessel that docks at one of these ports violates Ukrainian law and international sanctions. With tensions high over freedom of shipping on the Azov, U.S. Secretary of State Mike Pompeo said in Washington on Friday: "United States will never accept Russia's attempted annexation of Crimea." Without directly citing the Azov, he said Washington will impose "consequences until Russia returns control of the Black Sea peninsula to Ukraine." Speaking alongside Ukrainian Foreign Minister Pavlo Klimkin, Pompeo said Ukraine has "no greater friend than the United States" in its struggle against "Russian aggression." Business -- not just bullets crosses the no mans land between government-controlled Ukraine and the Russia-controlled section of the Donbas. Last Friday, 44,200 people in 5,600 vehicles pass through checkpoints at the administrative line in Donetsk and Luhansk, according to Ukraines State Border Service. Residents of the occupied areas largely come for low level trade and to pick up their Ukrainian pensions. The government expects to pass the 2019 budget at the end of this week, a record early date for Ukraine. Then in the week of Dec. 3, the IMF Board is expected to consider approving the $3.9 billion, 14-month standby loan to Ukraine, IMF spokesman Gerry Rice tells reporters in Washington. Prime Minister Groysman tells Reuters: We are counting on a tranche in December. Dragon Capital writes: Prospects for the IMF Board to approve a new lending program by year end look increasingly likely. Concorde Capitals Alexander Paraschiy notes the 2.3% budget deficit meets IMF demands. He adds: We expect the loan will be disbursed this year, but the key question is what will be its size. Analysts predict this first December tranche would be $1-1.4 billion. IMF board approval would also trigger release in December of a matching amount -- $800 million World Bank money and EUR500 in EU aid. Reviewing debts due in the months leading up to the March 31 presidential elections Timothy Ash writes: It does not appear that Poroshenko will have a huge war chest to pump prime that much before elections. The Kharkiv Tractor Plant, once the largest tractor plant in the Soviet Union, is to receive $100 million in investment, according to Oleksandr Yaroslavsky, owner of the DCH group, which owns the massive plant. Long starved for investment, the plant produced only 794 tractors last year, a low output for a work force of 3,000. Yaroslavsky tells Interfax-Ukraine that under a current, $8 million modernization, 200 model improvements have been made. The first goal is to win back the Ukraine market, then work on regaining lost foreign markets. UkrGazVydobuvannia, responsible for 75% of the nations gas output, plans to build next year a $3 million, 3 MW solar power plant at its Shebelynka gas refinery, 80 km south of Kharkiv. UGV is under pressure to produce more gas. It is not known if the solar plant will power the gas refinery, freeing up gas to help UGV meet its production targets.